The Volt is an amazing combination of massive ventilation, svelte weight, and high tech comfort. Eleven frontal vents corral massive amounts of air with the help of the Volt's custom sculpted Composite Fiber Intakes CFI which direct flow to the helmets internal StreamJet Ventilation Channels. Rearward exhaust ports and the moisture wicking X Static Padding work in tandem to help keep the rider cool and dry. The Volt is made even more comfortable by Bell's next generation Twin Axis Gear TAG fit system that allows riders to both dial in the exact fit, as well as adjust the mechanism's vertical position on the back of the head. Designed to be used on or off road, the Volt features Bell's removable Variable Position Visor VPV and is equally at home racing road or mountain. Your browser isn't supported for displaying eBay items. 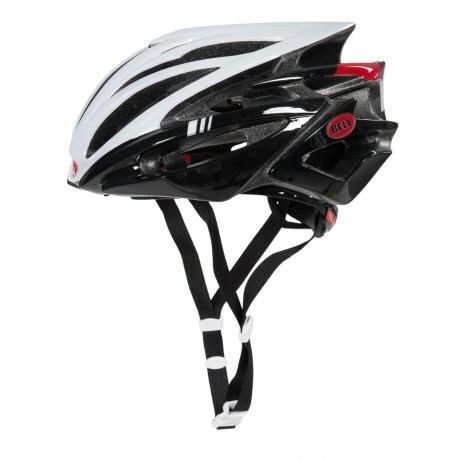 Go to eBay to search for Bell 2014 Volt Road Cycling Helmet.